Also know in the textile trade as “wash care labels” - ADE will now be able to assist you with either customized preprinted, and/or blank clothing tape. 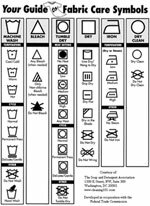 Wash care labels are used to provide you with helpful information such as caring instructions for clothing & garments, and various other applications. Our clothing tape is thermal transfer printable, and can be used on any of our SATO brand of label & barcode printers . The clothing tape meets with the stringent demands of the textile, apparel, clothing and garment industry and is resistant to steam pressing; dry cleaning; laundering/washing fastness; and possible abrasions. If there are other sizes that you require please contact us and we will gladly help you. We can supply thermal and bond till rolls, we have all the standard sizes available to meet with the requirements for restaurants and various different retail outlets. All the till rolls are mostly supplied in white only, but at a once off charge we can arrange for your companies details to be printed in a colour of your choice at the back. As a result of the increased usage of debit cards as a method of payment, we can also assist our customers with these thermal receipt rolls. If you are not sure what you need – just give us a call, we are happy to help. For Other sizes and 25mm & 2 ply please contact our sales department and they will gladly assist you.